What's a ZenFone 2 with a better camera worth to you? Asus adds svelte styling and a 3x optical zoom snapper to the ZenFone 2. While the new traits are welcomed, neither makes a convincing enough argument to make this your next phone. There have been huge advancements in the lens technology found in today's smartphones, but it's still commonly the low point of the experience. The Asus ZenFone Zoom hopes to reverse that trend. To do that, Asus' latest phone packs in a snapper that's capable of 3x optical zoom, a unique capability that allows you to magnify a photo without seeing any of the added visual artifacts caused by digital zoom. The Zoom isn't the first smartphone to have optical zoom. That honor belongs to the Samsung Galaxy S4 Zoom, which was capable of an even more impressive 10x optical zoom. Comparing the two, the Zoom clearly wins the battle when it comes to being a much thinner device. And while it has an impressive rear-facing camera that is packed with features, there isn't much else about the package that helps it stick out against its competitors. The build quality is a clear step-up from the cheap-feeling and surprisingly fragile Asus ZenFone 2, but the Zoom values novelty over practicality. And where its ZenUI attempts to be practical, it often ends up getting in the way, just like the protruding camera bump. 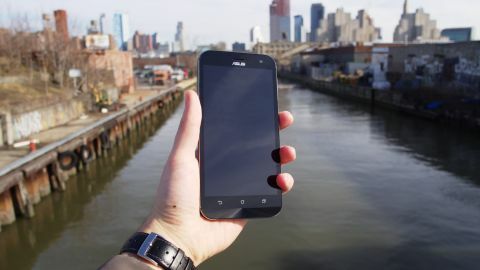 All said, this is easily the best looking Asus phone yet, but the added camera and a svelte look result in a price tag of $399 (about £286, AU$554, though the ZenFone Zoom isn't available in these regions). Like the ZenFone 2, the Zoom is available unlocked, except it costs $100 more, and largely mirrors its specs. The deciding factor is this: If you're one who generally prefers to shoot on auto mode, letting the camera do the heavy lifting with minimal input, you'll be better served by other Android phones with far less bloatware, a smaller chassis and buttons with more "click" action. Asus has raised its own bar with the design of the ZenFone Zoom. The effort here scraps the forgettable aesthetic of the ZenFone 2 in favor of a phone that has fewer bad sides. But, refined as it may be, it isn't in the same league of more precisely engineered smartphones chasing after the "world's thinnest" crown, like the Samsung Galaxy S7 and the Google and Huawei-made Nexus 6P, to name a few. But the ZenFone Zoom has visual flourishes in spades. The deep blue spun metal effect is the most noticeable effect, giving its face some flair to stand out. The guts of the Zoom are nestled into an anodized aluminum frame that gives off a luxurious look and feel, but the horizontal slits made to benefit antenna reception look rather similar to the iPhone 6S and some others. You'll find all of its physical buttons on the right side of the device. There's your usual power button and volume rocker, but the Zoom also mimics the build of a point-and-shoot, with buttons dedicated solely to taking photo and video. It's easy enough to learn the location of each, but reaching blind for one over the other can be a bit of a challenge because the buttons are too squishy, lacking the preferred tactility, or click action, of an actual camera. If you're looking for the headphone port, it's on the top. The micro USB port is on the bottom of the device, next to a loop where you can insert the included wrist strap to safeguard the phone from drops while snapping some pictures. Flipped over, the Asus ZenFone Zoom takes an unexpected, but welcomed, turn in its design. Dark blue-tinted leather coats its back from top to bottom, and hugs the curves of the phone beautifully. The leather isn't too grabby, it's smooth to the touch and easy to pocket without a fuss. Asus' choice to add leather gives the ZenFone Zoom the look of a high-end camera. The protruding bump, for example, is circular and mimics a large camera lens. There's also a stitch-detailed leather lip, which acts as a grip when you're snapping a picture. It shares the leathery backside with a small speaker grill, as well as pressed Asus and Intel logos. Overall, the phone's sizing is bigger than the ZenFone 2, coming in at 158mm in length, 78mm wide, and weighs 185 grams. At its thickest point (due to the most ultimate of camera bumps,) we're dealing with almost 12mm. That handily beats the HTC One M9's 9.4mm and the Nexus 6P's 7.3mm, but won't earn a trophy for this rather dubious distinction. Asus opted with a slick, 5.5-inch sheet of Gorilla Glass 4, the latest iteration in Corning's tough glass. That's good news because it was missing in the Gorilla Glass 3-protected ZenFone 2, which didn't fare too well during our (unintentional) drop test. The screen isn't bezel-free, but the 3mm cushioning the left and right sides isn't bothersome. The blackened areas on its top and bottom are a bit bigger, but with reason: that's where Asus stuck the front-facing camera, notification LEDs, and capacitive buttons, among other features. The ZenFone Zoom uses the same LED-backlit IPS display found in the ZenFone 2. At its best, it's capable of an image with a surprising amount of "pop." But it's guilty of the same low points, like how the screen is overly dim even whether or not auto-brightness mode is switched on. Turning it off and tweaking it to about half brightness should fix the issue, but it doesn't. The effect lacks the vibrant glow that you're probably seeking. Brightness aside, the screen also lacks the high-resolution pixel density that's available in many leading flagship smartphones, such as the Samsung Galaxy S7 and iPhone 6S. Though, as the Nexus 5X and OnePlus 2 prove, 1080p is still the standard and the spec that helps to keep the price down.